Seasoned chef Martin Kobald brings you a feast of the senses with an array of exquisite nibbles, perfectly paired with the elegant J.C. Le Roux Méthode Cap Classique at this year’s Taste of Joburg, held from 24 – 27 September 2015. Austrian born Kobald, Honorary President of the South African Chefs Association, will present four bespoke pairings that will each bring out the unique flavour profile of J.C. Le Roux La Vallée, La Vallée Rosé, Brut and the signature Cap Classique, Scintilla 2008. Boasting creamy buttery tones, the palate pleasing demi-sec La Vallée will be paired with a Thai inspired chicken salad in a crisp wonton cup. A pairing the chef thoughtfully selected to enhance the irresistible flavours of lemongrass, coconut and coriander. For the blushing La Vallée Rosé with its hint of sweetness, Kobald created a local favourite of Cape Malay beef curry bunny chow topped with fruity mango chutney. “As the curry spices tantalise your taste buds, the mango chutney and fruit tones of La Vallée Rosé leave a sensation of sweetness in your mouth resulting in the perfect bite!” he enthuses. 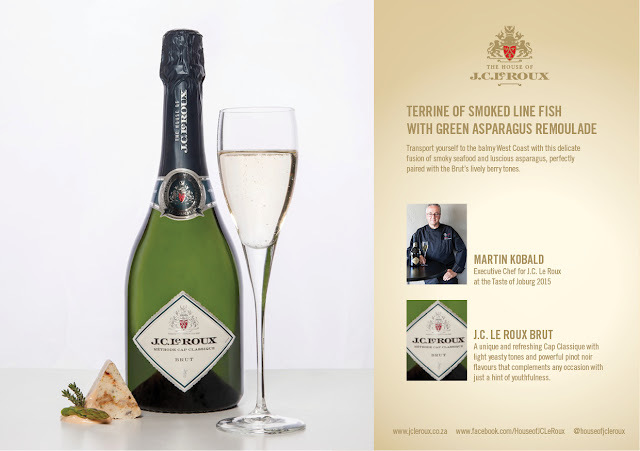 Not to be missed is the delicate terrine of smoked line fish with green asparagus and remoulade that melds seamlessly with the Brut’s crisp and refreshing Pinot noir. J.C. 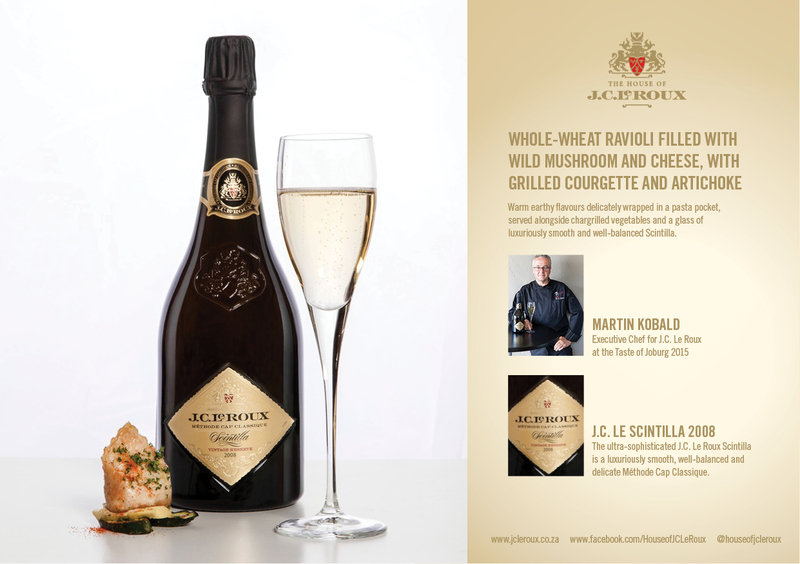 Le Roux’s signature Cap Classique, Scintilla 2008, has been expertly paired with delectable whole-wheat ravioli filled with wild mushroom and cheese, with grilled courgette and artichoke. Each J.C. 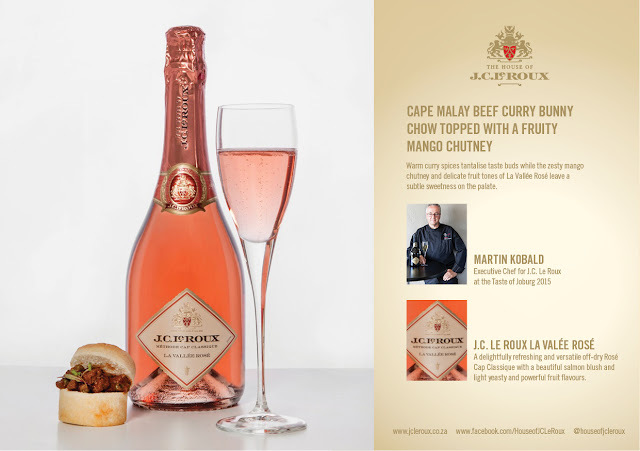 Le Roux Cap Classique is crafted in the time-honoured French tradition whereby the delicate bubbles are created and captured in every bottle during a process of secondary fermentation. South African bubblies made in this way are known as Méthode Cap Classique, as only the French version may be called champagne. No stranger to the international culinary field, Kobald is currently the Global Chairman for the World Chefs Without Boarders, as well as the figurehead for his own personal brand, ChefMLK. He recently received international accreditation from City & Guilds in London to train inspiring cooks to become professional chefs, with the first intake of students for the eight month Certificate Course starting in March 2015 and again in July 2015. Part of his busy schedule is his role as convener of the Bidvest World Chefs Tour Against Hunger which, together with over 260 chefs from 45 countries, raised over R8 million in aid of feeding over 5 000 children daily for up to five years. Fans of foodie television will also recognise him from kykNET’s Bring & Braai and Chopped SA on DSTV. The annual Taste of Joburg at the Monte Casino Outdoor Event Area offers food lovers absolute gourmet pleasure, representing the best of South African producers. Tickets are available from R80, visit www.tasteofjoburg.com or itickets.com. 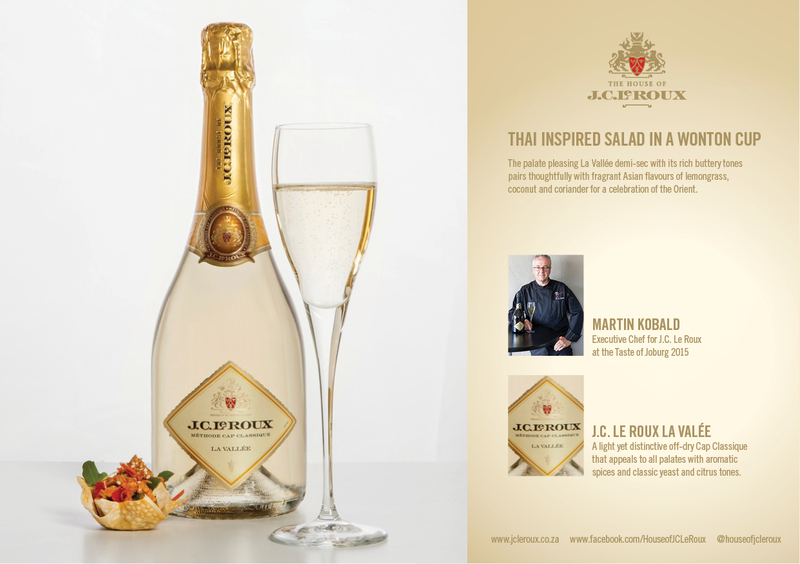 For more information visit www.jcleroux.co.za and www.facebook.com/HouseofJCLeRoux. Be part of the conversation and follow @JCLeRoux on Twitter and @HOUSEOFJCLEROUX on Instagram.